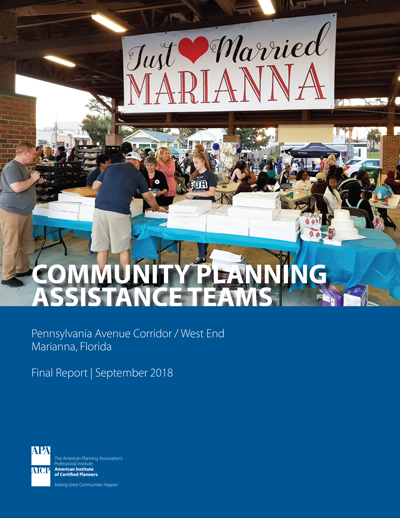 The City of Marianna, Florida, together with Jackson County, requested the services of the American Planning Association’s (APA) CPAT program to conduct a planning study of the Pennsylvania Avenue corridor, a significant gateway to the city, extending from Interstate 10 to US 90/Lafayette Street. The full team visited Marianna from February 24–March 2, 2018. Results from a brief survey, informal discussions, and focus group discussions with more than 100 community members revealed commonalities that informed the team’s analysis. This final report includes a review of existing conditions, including economic and transportation data as well as land uses and character, followed by the team’s recommendations. review city permitting processes and identify opportunities for streamlining.